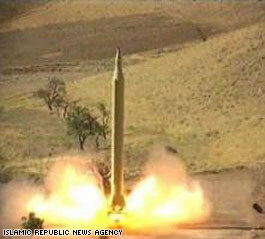 Why Islamist Invaders and Occupiers Of Iran Test Fired Nine Missiles On 18 Tir (July 8th)? The Major News Media Like CNN Are Promoting The Taazi Trap Game Without Clearly Understanding What Are They Doing or Exposing The Regime Game...? Are the G8 Leaders and Journalists ignoring the warning by Andrei Sakharov father of the Soviet hydrogen bomb and Top Human Rights Activist ?????? It's Time for the Revolution in Iran. It's About TIME! A short review of the the story behind the unrests which have shaken the foundation of Islamic regime in Iran. After years of humiliating and suppressing Iranian people in every way they could, Islamic rulers are now facing the backfire of their actions which has made them worry about future of their system. 18 Tir Video - JOIN YOUR BROTHERS & SISTERS IN THE MARCH FOR IRANS FREEDOM! Nation-wide demonstrations and strikes planned for 18th of Tir (July 9th, 2009) in IRAN to commemorate the 10-year anniversary of the Kooye Daneshgah Student uprising of 1999...English song-lyrics Shahyar Ghanbari, guitar Armik. 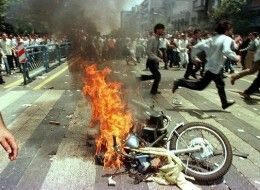 Iranian people announced short term 3 days general strike to commemorate 18 Tir, the anniversary of the 1998 Tehran University student uprising and murders, and to protest the murders and imprisonments of the June uprising protesters and July 9th 18 Tir mass demonstrations in all cities of Iran. 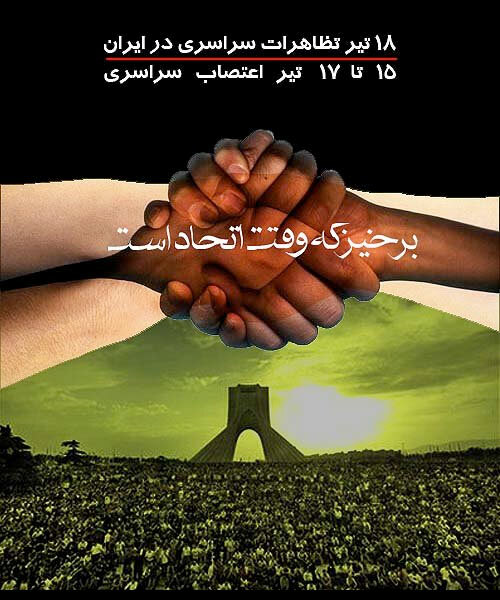 Iranian people are currently chatting about short term 3 days general strikes to commemorate 18 Tir, the anniversary of the 1998 Tehran University student uprising and murders, and to protest the murders and imprisonments of the June uprising protesters and July 9th 18 Tir mass demonstrations in all cities of Iran. This is an email from my 18 year old PEN PALL from Iran, it is very touching. I cover with stylish and long white socks and red shoes and beautiful brown hair and a long tail, sometimes dark, sometimes my mother Mybstm Mybaft to me, and good-looking the situation over and school Myrftm what was once did we have to go to school like a thick !? And asks that the Nbvdnt Nbvdnt live! You live? Being there? امشب بعد از خبر ساعت 21 از شبکه یک احمدی نژاد به صورت زنده تو تلویزیون حرف می زنه. یادتون نره اتوها، سماورهای برقی، بخاری های برقی و به طور کای هر وسیله برقی پر مصرفی ( گرمازا) به محض شروع شدن حرف های محمود به برق بزنید تا بفهمن ما هم هستیم. Tonight, after 21 hour news network Ahmadinejad as a live television talk you polygamous. Yadtvn نره Atvha, Smavrhay electric, electric stove and electric device as Chi-filled input (calorific) be started as soon as the letter of Mahmoud electricity We are Bfhmn click. 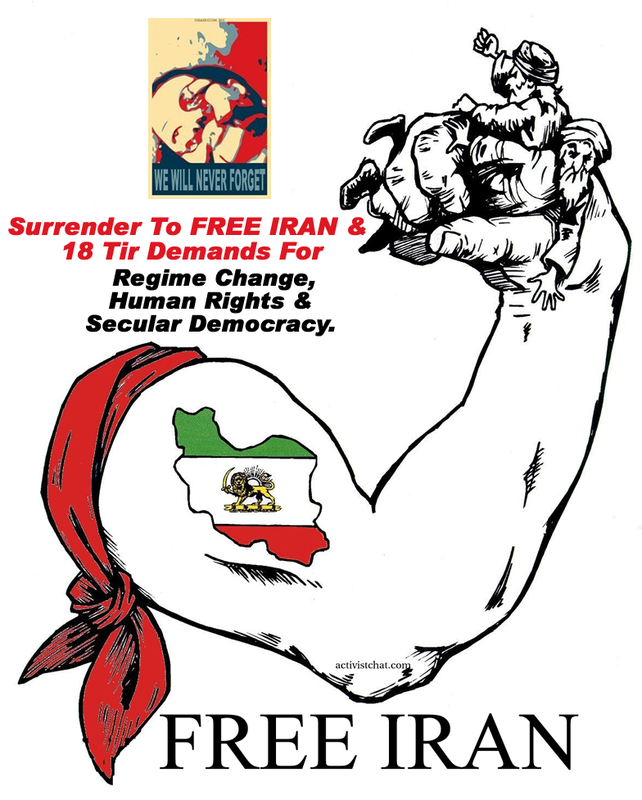 Surrender To FREE IRAN NEDA & 18 Tir Demands For Regime Change, Human Rights & Secular Democracy. The anniversary of the 18 Tir, the Iranian Students National Uprising, is once again upon us. 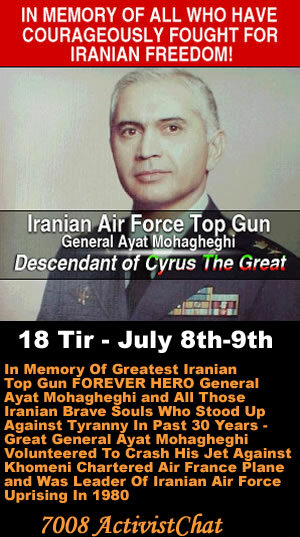 The 18th of Tir (July 9th) has become a symbolic struggle and resistance against the tyrannical, totalitarian and barbaric Islamic regime in Iran. The very brave and courageous freedom loving Iranians have been challenging the very fabric of the Islamofascists in Iran. In a show of solidarity, both in Iran and abroad, Iranian people have demanded a total annihilation of this totalitarian state of Islamic barbarity and terror, which lacks even the most basic human compassion and human rights. از خداوند بزرگ سپاسگزارم که به این سرزمین جوانانی عطا کرده است، که هم خردمندند، هم دلیر، هم تشنۀ آزادی اند و هم جویندۀ راستی و حق. از پدران و مادران ایران زمین از ژرفنای وجودم سپاسگزارم که در سیاه ترین دوران ها، روشن اندیش ترین فرزندان را پرورده اند. ده سال پیش از این، در ۱۸ تیر ۱۳۷۸، تاریک اندیشانِ چیره بر میهن، فریاد آزادی خواهی و حق طلبی جوانان ما را به وحشیانه ترین وجه سرکوب کردند. در آن روزها، سردمداران رژیم، چون همۀ ستم گران تاریخ، براین خیال باطل بودند که با خشونت کور می توان �خواست معطوف به آزادی� را نابود کرد. امروز اما جهان شاهد این است که آن �فریاد بزرگ�، نه تنها نمرده است، بلکه هزاران بار زنده تر از پیش، در آسمان ایران زمین طنین افکن شده است. دانشجویان، کارگران، آموزگاران، روحانیان و سپاهیان ایران زمین! �ارزش های جهان شمول� چون �آزادی وجدان�، �برابری زن و مرد� و �حق آزادی بیان�، ارزش هایی �فراملی�، �غیرنسبی� و �جاودانی� اند که هرگز نمی توان سرکوب شان کرد. از این رو دیری نخواهد گذشت که ما ایرانیان نیز، با یاری و همدوشی یکدیگر، چون دیگر ملت های آزاد جهان، یکایک این �ارزش های بنیادین� را در چارچوب یک �قانون اساسی نوین�، پایۀ زیست سیاسی قرار خواهیم داد. ایرانیان، نبرد امروز ما با این حکومت �ستم گر�، جز برای �آزادی� و �مردم سالاری� نیست. روشن است که این نبرد، که نبردی است به دور از خشونت و مبتنی بر والاترین ارزش های انسانی، برای ابراز وجود خود نیاز به جواز ندارد. شما با اعتراض های متمدنانه و پیوسته اتان به جهان نشان دادید که برای �حکومت کودتایی� حقانیتی قائل نیستید و دولت زورمدار و مردم ستیزی را که �تقدس صندوق رای� را لگدمال کرده است، به رسمیت نمی شناسید. با در نِگر گرفتن همۀ این امور، آشکار است که هرگونه راه پیمایی و دادخواهی، که بنا بر �روح تمدن پر شکوه ایرانی� مسلما به دور از هرگونه خشونت خود خواسته انجام می گیرد، نیاز به مجوز از هیچ نهادی ندارد. و در اینجا، من، به مسئولان درجه اول این جمهوری ضد اسلامی و ضد ایرانی گوشزد می کنم که مردم ایران زمین، به عنوان یگانه مالکان این آب و خاک، مجاز و مختارند که تا رسیدن به آزادی کامل، در هر نقطه از سرزمین خود و در هرگاه که خود مایلند و تشخیص می دهند، به خیابان ها و میدان ها آمده، دست در دست، و دوش به دوش یکدیگر، صدای دادخواهانۀ خود را به گوش جهان برسانند. به خود آیید، دست از ویرانی برکشید، فریاد آزادی را بشنوید، و از سر راه مردم کنار بروید. ایرانیان، پایداری و همبستگی میلیونی شما مافیای حکومتی و دستگاه های سرکوبگراش را به هراس انداخته است. حکومت اسلامی امروز در بدترین شرایط روحی به سر می برد، در حالی که پیکار هوشمندانۀ ملی در آستانۀ فازی نوین قرارگرفته است. هم میهنانم، امروز پیکار ملی می رود تا در این فاز نوین، فرای راه پیمایی های خیابانی و شعارهای شبانه، سلسله اعصاب رژیم را نیز هدف قرار دهد. فازی که در آن، هسته های مقاومت مردمی در سراسر کشور و در میان همۀ طیف های اجتماعی تشکیل شده و مبارزه، از طریق انجام اعتصابات سراسری، گام به گام، تا فروپاشی کامل و نهایی رژیم و برافرازی یک حکومت مردمی، قانونی و مدرن، به پیش برده می شود. من، برای رسیدن شما به این هدف عالی و غرورآفرین، با تمام توان با شما خواهم بود. 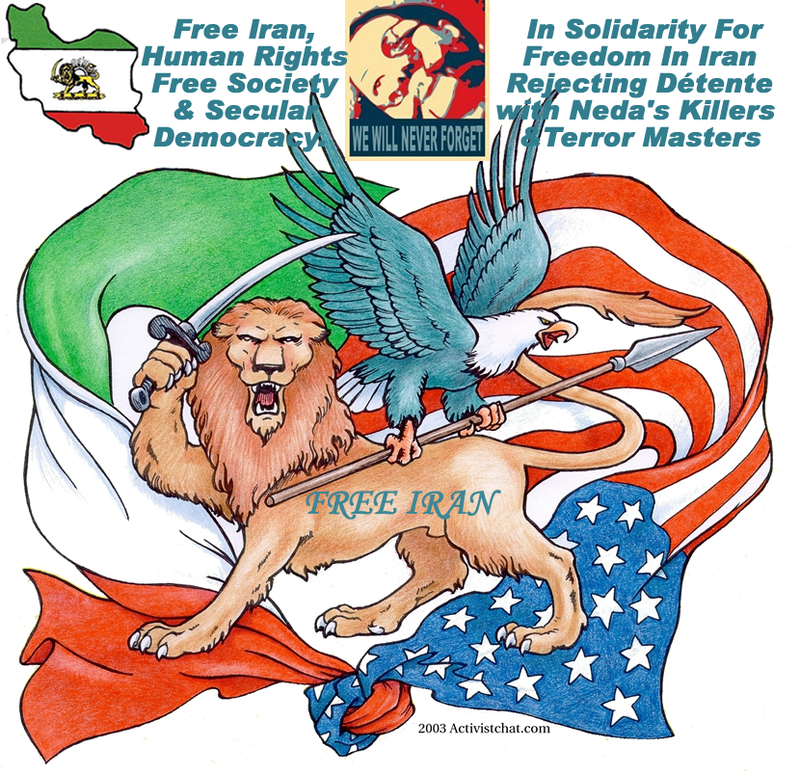 In Solidarity For Freedom In Iran Rejecting D�tente with Neda's Killers & Terror Masters. 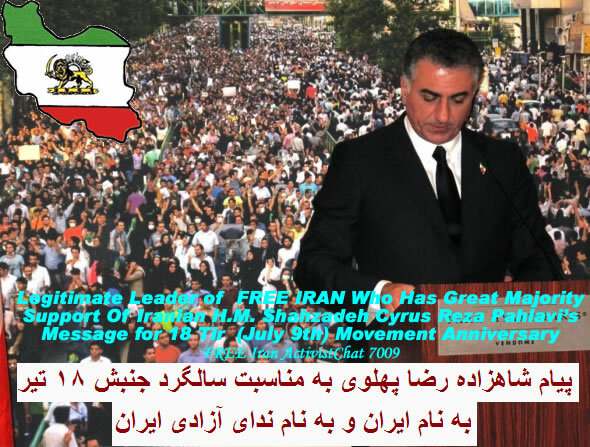 Support Free Iran, Human Rights, Free Society & Secular Democracy. Tehran, Keshavarz Blvd, Iranian are protesting against fraud election result.They also value student revolution in 9 July 1999. 1:31 PM ET -- Scenes from today. From a reliable Iranian on Twitter: "One guard was running after us holding his hand up with a baton but he kept saying don't be afraid i wont hit u!" TEHRAN, IRAN � Hundreds of young men and women chanted "death to the dictator" and fled baton-wielding police in the capital Thursday as opposition activists sought to revive street protests despite authorities' vows to "smash" any new marches. 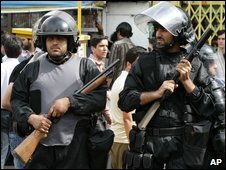 Iranian police have been maintaining their street presence to deter protests Iranian police have fired tear gas at hundreds of demonstrators who defied government warnings that any fresh attempt at protests would be "smashed". The marchers were heading towards Tehran University to commemorate the 10th anniversary of student unrest. All gatherings have been banned in a crackdown on mass protests that erupted after the disputed election of 12 June. The BBC's Jon Leyne says the opposition is trying to put momentum back into the campaign against the vote result. Enghelab sq. getting busy. Forces are present. People protest in front of Chinese embassy as well! Heavy Security Forces at Enghelab Sq. No Mobile Network at Centrlal Tehran. Riot Guards moving to Enghelab sq - Police force being ordered back to bases. Thousends of people gathered in front of Polytechnic Uni and moving toward Valieasr St..
Basij & plainclothed at & around Dr. Beheshti Sq. At 5 pm , thousends of people will march toward Valieasr St in support of political priosoners and will chant " Political prisoners should be free"
At Enghelab Sq ,people walking on pedestrian ways,Police forces are there as well ,plainclothes are beween people. Teargas fired at Enghelab Sq. clashes in Enghelab and Azadi Sq. Police arresting seemingly at random, throwing tear gas into buses. Hundreds of Protesters chanting against the regime infron of Ploytechnic University, Near Azadi Sq. Protests reported in Tabriz, Isfahan & Shiraz as well. Isfahan streets are full of plaincloths and ppl are standing in streets from Khaju Brdg to Siosepol! Gathered ppl at Ferdowsi Sq r increasing ,thers's a big crowd! More than 30 ppl were arrested againt Tehran Uni..
PPL got attacked and eye witness reported bloody PPL and teargas. Heavy Clashes in mohammad ali jenah St.
"Mr. Gloran Lindblad is a Chairman of The Swedish Delegation to the Parliamentary Assembly of the Council of Europe (PACE) and President Political Affairs Committee PACE. At the moment, he is in a state of passing proposal to deter diplomatic Relation between European Union with Iranian Gov. Mr. Lindblad asking all Iranian people to submit all their documents forwarded to his attention in regards to Human Rights Violation. Please bring your petitions and back up documents, reports, pictures, videos�s which happened during the past few weeks to his attention. It is very important all Iranian from all over the world e-mail him and plea for mercy and asking the European Union to deter the diplomatic relation with Iranian Regime. http://www.youtube.com/watch?v=tWQXWqJS2YE Tehran around enqelab square,9 july! A very interesting video about Vladimir Putin, his KGB background, politics, presidency and solidifying enormous power in Russia. It is about one hour and 45 minutes long. Saving the WEB link make it possible to watch portions of it at a time. Once again the brave Iranian people demonstrated their unprecedented pursue of Freedom, Democracy, and Happiness. Time to be proud again. At the same time and on this exact date, to appease murderers of Iranian people, Barack ordered the release of 5 IR terrorists in Iraq. The fact is Iranian people don't care and don't give a damn anymore about any outside figure including Barack Obama and his gang of appeasers. This is the first Digital Uprising and unlike the previous revolt, the present "Rastakheez" is being conducted by real brave and educated minds. No one can brand them CIA, MI6, BBC, NYT, CNN and alike, because Iranian people in their home grown Rastakheez are totally independent of all those junks. At this point, Iranian people are no longer 2-Dehis, Marxist, or Jebhe Melli-Mazhabi where some might get their marching orders from like Putin, or Obama. They are only Iranian. Real Iranian. And the world can only and is forced to accept this reality. Upon this tenth anniversary of the violently repressed 18 Tir (July 9, 1999) student protests, we will gather to remember the past sacrifices of thousands of peaceful student protesters and the millions resisting religious tyranny today. to show their solidarity with the Iranian people�s most human and most basic of desires: to be free! خدایا ای خدای مهربان ایران! من نمیدانم به کجا بروم و شبانه روز به درگاهت دعا کنم حتی در حالی که زانو زده ام و راه میروم یا سرم روی زمین است ساعتها باقی بمانم تا دلت برحم بیاید و ما را نجات بدهی درسته که تو سرنوشت قومی را تغییر نمی دهی مگر اینکه آن قوم بخواهند ولی حالا که ما خواسته ایم و برای خواسته خودمون خون و جون داده ایم پس تو هم نگذار بیشتر از این عمرمان تلف شود ما میخواهیم با همه ملتها با صلح زندگی کنیم و به آنها فرهنگ غنی ایران زمین را بیاموزیم . ما میخواهیم حتی با مردم اسراییل و آمریکا و انگلستان و هر کشوری که با دولت ایران مخالف است رابطه برادر و خواهری داشته باشیم و بگوییم برای همه مردم دنیا از هر دین و هر ایدئولوژی ارزش قایل هستیم و به آنها احترام میگذاریم . ما میخواهیم همه بدانند ملت ایران با دولت ایران و حکومت ایران و کسانیکه که بر مردم حکومت میکنند فقط با کشت و کشتار است که مانده اند و حرف دولت ایران هرگز و هرگز حرف ملت ایران نیست و ما دولت و مجلس و هرکسی که با اینهاست را هرگز از خود نمیدانیم ،همینطور که همه دنیا این مدت دید و می بیند بازهم بداند ما تا سرحد مرگ به این مبارزه ادامه میدهیم و میدانیم که پیروزیم چون حق باماست .